Sierag, D.D, van der Rest, JP.I, Koole, G.M, van der Mei, R.D, & Zwart, A.P. (2017). 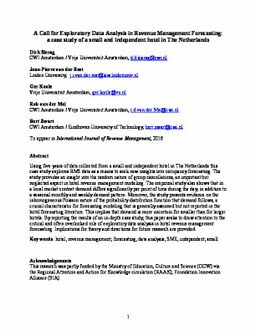 Exploratory data analysis in revenue management forecasting: a case study of a small and independent hotel in The Netherlands. International Journal of Revenue Management.